Weighs only 38 lbs and pulls 15,000 pounds. So light you can hand carry it to the job! Fast mounting ­ platforms, davits, trolleys, cranes. Easily put pulling power wherever you need it. "stacking" that can reduce lifting/pulling power. lubrication to help prevent "friction wear" and heat rise. amps, 230 v- 8 amps. switch connections and of main box assemblies. made from permanent mold equipment. ground steel worms. Gear ratios: 533:1 and 267:1.
or inversely with the 4 mounting holes below drum. carrying bearings at drum section. and a Safety Latch on all hooks. and comes with oil in gear box for quick field usage. based on line voltage at motors (115 v or 230 v). To order a quick disconnect option for the RMO or RMA add an "X" after the RMO or RMA and add $330.00. 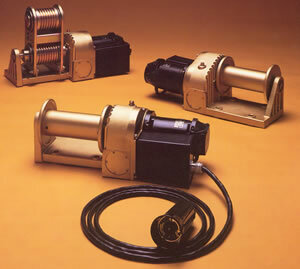 To order Double Drum winches, prefix above 20 models by letter "D". Add $1210.00 to above prices. an inch wide, thus reducing drum cable capacity. ACP-22 Handle - For carrying winch. ACP-52 Trolley (6" I-Beam) - Has 1200 lb. capacity and hoist headroom of 11 1/2 ". Note: Use a minimum cable safety factor of 5:1 and a Safety Latch on all hooks. 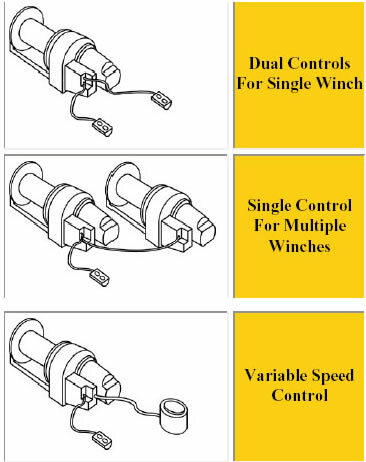 Winches, Spur Gear Winch, Winch, Winch Hoist, and Winches from your source for material handling equipment.